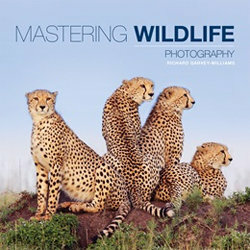 Mastering Wildlife Photography is the latest title from experienced wildlife photographer Richard Garvey-Williams. Spending his childhood year in East Africa, he developed a love for wildlife photography and in this book we see his passion for the subject through his stunning images. From the very large to the very small, every aspect of wildlife photography is covered in the book. The book begins with a few general principles on the subject, from the subjects, lighting and composition of the images and capturing the moment before it disappears. Colour temperature, intensity and supplementary lighting is looked at as well as ethical considerations for the subject you're photographing. Frames, viewing angle, patterns and backgrounds are covered in great detail before the book moves on to capturing the moment, including the basics of exposure, depth of field, drive mode and autofocus settings. Equipment is taken into account with a dedicated chapter on how you can use adapters, extension tubes and teleconverters to get closer or achieve a better view of your subject. Perhaps one of the most important parts of wildlife photography is field craft, with the challenge of not only finding animals but knowing how to behave in order to get the shots you want without scaring or spooking them. Each chapter includes handy tips for the photographer, with helpful bullet points on the achieving of images and hints about certain habitats and how they can be utilised for optimum photos. Also looked at are studio and location sets, animal portraits, capturing animals in action and close up animal photography before the book moves on to discuss post-production techniques and how photoshop can be used to tweak your images. Overall, this is a comprehensive and detailed wildlife book that's full of stunning images of all types of creatures. It's great for those who need a little extra guidance on the subject or simply for those who want to see some charming images and pick up a few tips along the way. A great read.